Idea #1: Have Yourself a Merry Christmas! What do all those birds mean? It’s certainly that time of year… so a re-post is in order! On the eve of Christmas, we thought revealing the code for the popular carol was appropriate… especially since we never knew its true meaning! Maybe it’s common knowledge for most? 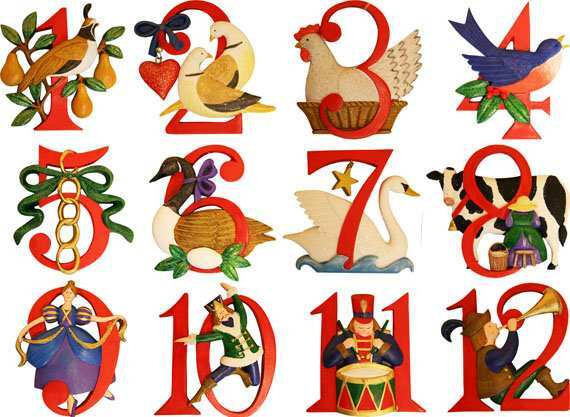 But for those who don’t celebrate, you may be surprised at finding reference to the Old Testament and Torah in the popular song, The Twelve Days of Christmas. History has it that from around 1558 until 1829, Roman Catholics in England were not permitted to practice their faith openly. The famous carol was written as catechism for young Catholics during the holiday season. There are basically two levels of meaning: the surface, plus a hidden meaning that was known only to members of the church. Each element is code for a religious reality which children could easily remember. Partridge in a Pear Tree is Jesus Christ. Two Turtle Doves were the Old and New Testament. 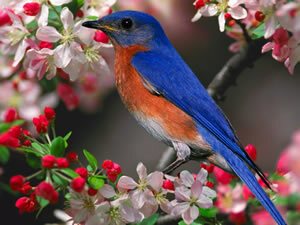 Four Calling Birds were the four Gospels of Matthew, Mark, Luke & John. Five Golden Rings recalled the Torah or Law, the first five books of the Old Testament. Six Geese A-Laying stood for the six days of creation. Eight Maids A-Milking were the Eight Beatitudes. Ten Lords A-Leaping were the Ten Commandments. Eleven Pipers Piping stood for the eleven faithful disciples. Twelve Drummers Drumming symbolized the twelve points of belief in the Apostels’ Creed. filled with light, love, laughter and family! with a personalized gift certificate! There’s really not much time left to find that perfect gift and get it by Christmas, but offering a shopping spree at a cool store is always fun! Folks do love to browse and shop for themselves… especially when they’re not paying! So many unique, yet bird-friendly items to be had, it might even be a difficult choice! 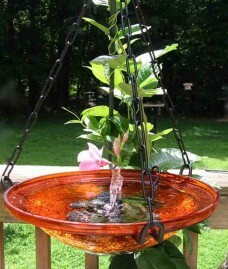 The hanging bird bath shown includes a solar bubbler and decorative river rock. The rock helps to both camouflage the pump and offers birds better footing. 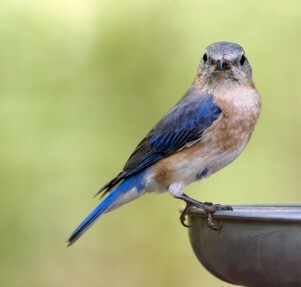 Because fresh water is the best way to entice feathered friends, moving water is even more effective! 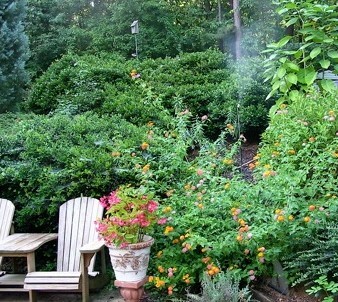 The pumps (solar and electric) are offered separately so they can be added to an existing birdbath if preferred. 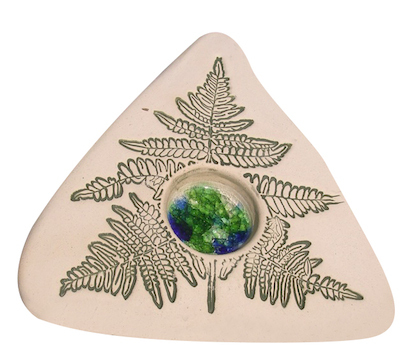 Leaf misters, bath drippers and water wigglers are all neat accessories with big impact. Moving water simply attracts more birds! And that immediate, personalized gift certificate? No kidding! Purchase any an e-gift and we’ll email you a large, colorful, personalized gift card to print out and give to the recipient. Place it in a box, gift-wrap, and ta-dah… one awesome gift in hand! 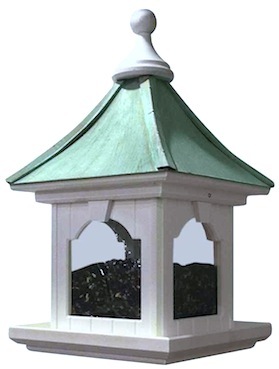 Tons of fun to choose from including birdhouses, feeders, garden art and more. The list is complete and shopping is done! 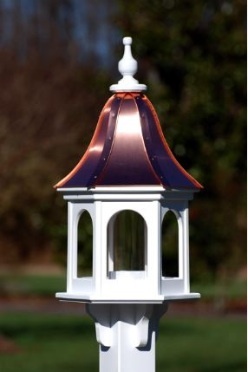 Still Time for Stunning Copper Bird Feeder Gifts! So many great suggestions… so little time! 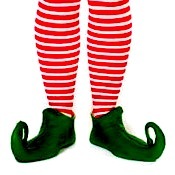 The elves got caught up with the “holidaze”, busy-busy crunching out fantastic gifts birds love! That’s basically where our other 22 gift ideas went, it’s been all hands on-deck! As far as getting it there by Christmas without spending a fortune on expedited shipping? We’ve got this one figured out! 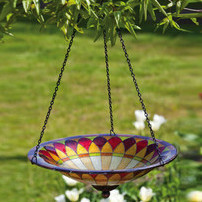 You can send an awesome copper bird feeder or house (with free shipping-as always). The recipient will receive a special package by the 24th, that’s sent Express Mail. It contains a few goodies for the birds, and a hand-written note letting them know something very special is on its way! Since there’s some info enclosed about the house or feeder, they pretty much know it’s one or the other… but they don’t know just how nice it actually is. Definitely a fun gift that piques curiosity! Aside from the traditional gazebo styles, there’s large capacity hoppers for the extreme birder. These newer designs accommodate 10, even 20 lbs. 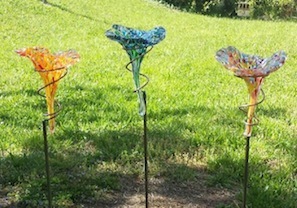 of seed, and offer post-mounted and hanging versions as well. Because all of our copper feeders and birdhouses are constructed (in the USA) of durable vinyl/PVC, they last a lifetime, and cleaning is as simple as using the garden hose with a forceful spray. No flanges or parts required for mounting, installation is simple with the attached mounting collar. It slides right on a standard 4×4 wood post, and the decorative brackets are included too. Both are vinyl to ensure there’s no deterioration. Even the finials are composite resin. The coolest thing is that these look like wood- you can’t tell the difference, and oh yeah… and birds love them too! But this pre-gift package must ship by Monday, 12:00 pm, EST. It’s really the last call for an on-time Christmas delivery without wasting money on expedited ship services!